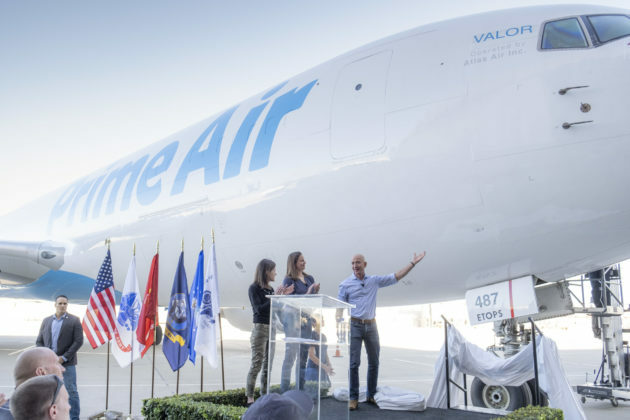 Amazon CEO Jeff Bezos is big on veterans, and in honor of Veterans Day, he presided over the vet-friendly christening of Valor, Amazon Air’s 40th Boeing 767 freighter. A cheering crowd, including more than 100 Amazon veterans and military spouses, was on hand for today’s ceremony at Long Beach Airport in California. After an appropriate drum roll, Bezos pulled down a banner that was slung over the plane’s nose, revealing the plane’s name. “Introducing Valor!” Bezos said. Amazon said the name was chosen by Warriors@Amazon, an employee affinity group for veterans. This entry was posted in GeekWire and tagged Amazon, Aviation, Jeff Bezos, Technology. Bookmark the permalink.